Now that we’ve completed the critical step of “planting our water” in our growing area, it’s time to plant the overstory trees. Phoenix has a great program through its two utility companies, SRP and APS, whereby you can get 2-3 desert adapted trees to plant in your solar arc. The programs stipulate that you need to plant the trees within 15 feet of the east, west or south side of structures. This allows the trees to provide beneficial shade on those hot sides of the house. Two of the trees in our swale are within 15 feet of the south side of Susie and Morris’ house. The third is not. When we discussed our plan with the utility company, they were ok with us using a third tree somewhat farther away as it will cast a cooling shadow on Donna’s western façade in the summer when the low setting sun is in the northwest and on Suzie and Morris’ house in the winter when the low setting sun is in the southwest. Trees in position where their canopies will just touch at maturity. First we placed the trees in the swale so that their canopies will just touch at maturity. These are a thornless, hybrid Palo Verdes (Hybrid Cercidium “Desert Museum”). Their mature height is 25-30 ft. with a 25-30 ft. wide canopy. The length of the swale is 80 feet long. We wanted some overhang on the sidewalk in front to shade passers-by so we placed that tree first and adjusted the others accordingly, making sure the other two trees were not too close to Suzie and Morris’s carport piers. Donna and Chip, hard at work planting the overstory. Because the trees will need to mature for a few years with their lower branches still attached to avoid “spindling” the trunks, we made sure we planted the trees where these branches would cause the least interference with the cars in the driveway. We will have to do some judicious pruning to train these trees in their formative years without damaging them – they grow really quickly, so we will keep an eye out for any problem branches. These trees with their bright green trunks and branches and dazzlingly yellow springtime flowers are going to look amazing here as they start to reach their full height. Even better is that these trees hold up incredibly well to our superheated urban desert landscape. We can’t afford to waste time and energy growing poorly adapted trees in a site like this that faces not only the hot setting sun but is also surrounded by hardscape, increasing the heat island around it. And they thrive on only minimal waterings even during the hot summers, once they are past the first two years of their establishment phase. Dad and Donna installing a trellis made of concrete reinforcement wire and t-bars against Suzie and Morris’ carport. After the trees were planted, my dad and Donna installed a wire trellis against Suzie and Morris’ carport. This trellis will support Hardenbergia vines to help shade the carport and block the line of site from this area into Donna’s bathroom shower window. Materials used were three metal t-stakes, three sheets of 3.5 x 7 ft concrete reinforcement wire, a handful of plastic zip ties to attach the wire to the t-stakes and a few large staples to hold the top of the wire against the flashing of the carport. The whole thing went up in a matter of minutes thanks to a homemade water tool that drilled the holes needed for the t-stakes with water pressure. The “water tool” consists of a 4 ft. length of bent pipe with a pressure nozzle at one end and a control valve at the other with a hose connection. Works great for drilling holes and trenches into compacted soils. It is also VERY messy! Mud everywhere! Dad and Donna stake out a string line along the edge of the French drain – we don’t want to dig into the landscape fabric and gravel! We wanted to make sure we knew where the edge of the French drain was so we didn’t dig into it! So Donna and my dad dropped a stringline along the length of it, giving us a good visual of where NOT to dig. All during the construction and planting of this swale, neighbors turned up to help. Some helped remove excess soil, others to level the bottom of the swale in preparation for planting. The neighbor across the street gifted my dad with some beers he sells – dad was delighted, he’ll always work for beer! And today, Doris, Donna’s neighbor to the south, lent a hand at hole digging. In the process, she also learned which species we were planting so she could try them in her yard as she was telling us she has had poor luck with many plants she’d tried on this super-heated western exposure. Neighbor Doris gets involved with the planting! The street in front of Donna’s house after a 1” rain event. This is the lower end of the neighborhood so they get stuck with all the stormwater. If enough neighbors upstream of this area harvested their rainwater on site, we could stop this from happening. And neighbors keep coming by to talk, ask questions and get inspired. My hope is that more of these projects will start popping up around the neighborhood – wouldn’t that be something to see! Maybe we could even have an impact on the flooding in this part of the neighborhood. Even though it’s Nov 2nd, it was a hot day in Phoenix. Here the plants are getting a long, slow soaking. Bet they’re glad to be out of those pots! We planted the understory shrubs and herbaceous layers so that the plants will be touching but not crowding each other out at their mature size. 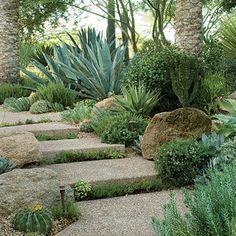 Right now it doesn’t look like there’s a lot there – mostly because we purchased small, 1 gallon sized plants – they tend to withstand transplanting better in our climate and they’re way cheaper to buy. Hardenbergia vine up against the trellis. These vines should start having sprays of purple blooms soon, earning it the nickname of “lilac vine”. They will bloom well into Spring, adding a burst of color to our winter landscape. Shape and tamp the berm a few more times so it’s more compacted. We had to take down the berm by about 75% because it was too big and left us with no planting room. Put down a layer of woodchips to help keep the soil cool and moist. This should happen next week after the tree trimmers visit. They’ll chip the tree waste and leave it for us to use. We may install an automatic drip irrigation system to this area to use during the establishment phase and after that for monthly waterings during the driest (Spring) and hottest (Summer) months. Right now Donna will deep water this area by hand by letting a hose dribble on sections for an hour or so once a week for one more week, then twice a month, then once a month to build up moisture in that area. And we still have left over dirt and urbanite. Donna will put out the word to the neighborhood on our Nextdoor page – that should get rid of most of it! Posted in Rainwater, Water Harvesting. Tags: collaborative, urban, water harvesting on November 3, 2013 by Jennifer. 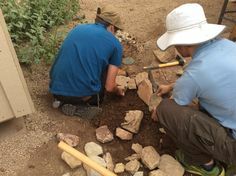 This is a continuation of the Collaborative Urban Swale project in downtown Phoenix, Arizona. See Part 1 and Part 2 for more information. Once the basic prep work of the swale area was complete it was time to build out the French drain. We decided to run the French drain along the southern edge of the swale (Donna’s side) to avoid the cement piers of Suzie and Morris’s carport. Look at all that dirt that came out of a 24 x 24” trench! It’s true what they say – soil “fluffs up” to about three times its mass when you dig it out. One of the big challenges with excavation projects is what to do with the dirt afterward because there is always some left over. In this case, some will be put back into the swale area. Some of the rest will be used by neighbors. Any that’s left over, Donna will move to her backyard and we will use it to design with later. The trench for the French drain along the south side of the planting area. We also wanted to widen the swale area a bit, so we decided to take out an 18” wide cement apron that ran the length of Donna’s driveway. This left us with some large chunks of “urbanite” to deal with. 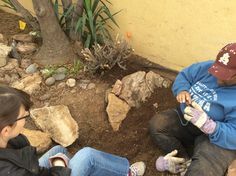 In true permaculture fashion, the problem of disposal became a solution when Donna (the homeowner) and Chip (the installer) rented a jackhammer and created some chunks of an appropriate size to put at the very bottom of the French drain. Donna showing off some mad skills with the jackhammer. 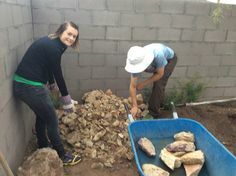 The big chunks of urbanite will form the bottom layer of the French drain, helping to fill it up and saving us money on the amount of river rock we had to purchase. We used Brad Lancaster’s book, Rainwater Harvesting for Drylands and Beyond, Volume 2, to guide us through the French drain process, specifically pages 106-113. You can purchase this WONDERFUL resource along with other books I regularly use from my Amazon store. As directed in the book, we first laid landscape fabric in the trench to hold the aggregate rock. The purpose of this is to stop root penetration into this area. Note that we used a 24” wide bucket on the backhoe instead of a 16” bucket. This left us with an 8” gap to the left of the trench which we had to backfill with soil. Using the 16” bucket would have saved us from having to go back and do this – one of those “lessons learned” things that you run across each time you do a project. The bottom layer of rock in the trench is the urbanite chunks, followed by some random gravel from Donna’s yard. After that was used up, we still had to order about 3 cubic yards of river rock to fill the 15” deep and 15” wide gravel part of the French drain. Now it’s time to cut the perforated pipe to length and put in the overflow drains. Donna gets to use more power tools! Cutting perforated pipe into sections to accommodate overflow standpipes. Next step is to lay perforated pipe on top of the rock, perforated side down. You want to make sure the area is level along the length. After the pipe is in place, the area around the pipe filled with additional rocks. Solid pipe connects the downspout to the perforated pipe in the French drain. 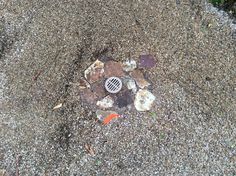 The perforated pipe, with its overflow pipes, is connected to the downspout by a solid pipe which drops more than the required 1/2” for every 10 ft.
Chip posing with the level perforated pipe in the French drain. All that’s left is to fill the space around the pipe with rock, with about 1-2” on top of the pipe, wrap the landscape fabric over the top and cover with dirt. Urban swale ready for planting. Voila! The finished swale ready to be planted! Notice the top of the swale is concave. This area will be filled with woodchips so the surface is nearly flat and slightly below the level of the driveways. 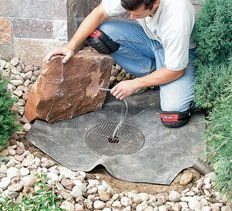 The concave feature will catch additional water in situations where the French drain fills up and water comes out of the overflows. If there’s still a surplus of water, we’ll be installing a level spillway at the end of the swale nearest the sidewalk. The overflow water will be directed into the street. To keep the woodchips from clogging up the spillway, we’ll plant some bunch grasses (either side oats grama or pink muhly) to hold back any debris while letting the water flow through. Next up – Planting the swale. Posted in Rainwater, Water Harvesting. Tags: collaborative, urban, water harvesting on October 29, 2013 by Jennifer. Now that we have the project parameters we can delve into the design. 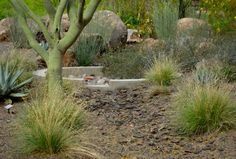 Below is an overview of the placement of the overstory trees, guttering and French drain as well as a detailed drawing of the understory plantings which include xeric shrubs, succulents and groundcover. All plants should be able to thrive on rainfall after the initial establishment phase. 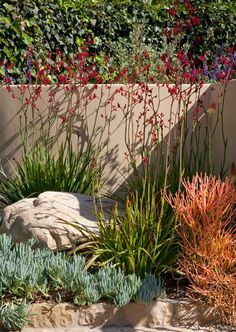 All plants were chosen for their xeric qualities; able to withstand high temperatures, reflected light and heat, and irregular watering. As many natives were used as possible. Items taken into consideration were: season of bloom, nitrogen fixation and food source for pollinators and local wildlife. 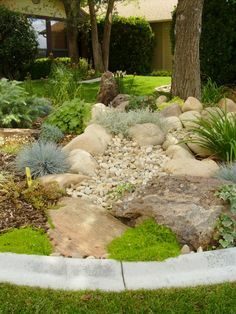 This is a typical Zone 4 planting and could be used equally well in nature strips and would thrive off local rains and harvested stormwater. A variety of seasonal wildflowers including various penstamons, salvia, Arizona poppies, toadflax, etc. Posted in Rainwater, Water Harvesting. Tags: collaborative, urban, water harvesting on October 28, 2013 by Jennifer.